Author Devin Scillian tells the most adorable “memoir” stories. First there was the cute and clever Memoirs of a Goldfish (if you haven’t read it, you’ve missed out on a fishbowl full of laughs! ), and now he brings us Memoirs of an Elf – just in time for Christmas. Within the pages of this Christmas book with a twist is the story of Spark Elf, Santa’s right-hand elf and keeper of the smartphone and GPS that keeps Santa on schedule and on course. In true journal style, Spark gives readers hourly updates about just what’s happening in Santa and his elves’ busy evening as they prepare to fly around the world delivering presents to excited children. Picture book and Christmas lovers learn all sorts of things by reading this book, like what the elves consider their most popular saying: “No snow, no Christmas”. They also learn little-known but important facts, like what a smart guy Santa is, how much Santa dislikes ginger snap cookies (who knew??? ), and how much he loves dogs. In fact, it is an adorable dog named Tugboat who throws Santa and the elves into chaos and almost forces them to reveal their secret identities when he stows away in Santa’s toy sack and isn’t discovered until the last toy is delivered and Santa is back at the North Pole. Now Santa has a dilemma. He can keep Tugboat for a year and send him back to his family next Christmas Eve, or he can whisk him back home immediately and risk being seen now that the sun has come up. 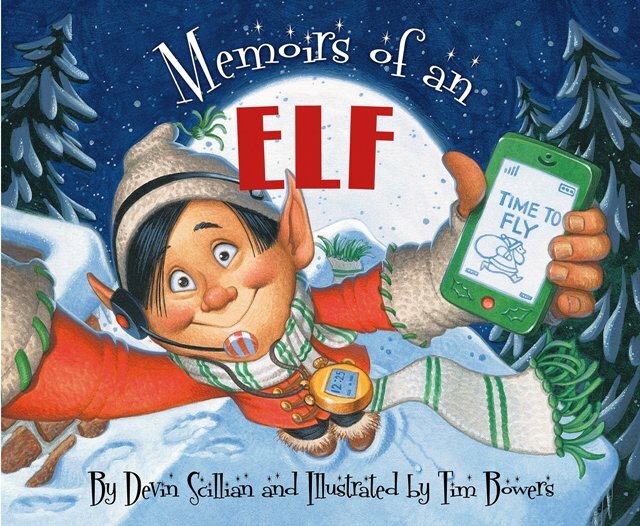 This sweet book is full of old Christmas cheer and new Christmas gadgets, like smartphones, GPS’s, and elves snapping selfies – oops, better make that elfies – every few minutes. The writing is humorous and age appropriate, and the illustrations of jolly old Santa, his rotund and doting wife, grinning elves eager to be of service and adventurous puppies with wagging tails should conjure a Christmas smile from even the scrooge-iest of picture book readers.